Whether you’re an entrepreneur opening your first restaurant or a seasoned business owner with many years of experience in the restaurant industry, you face many challenges. Among the most important of these challenges is your restaurant’s website. 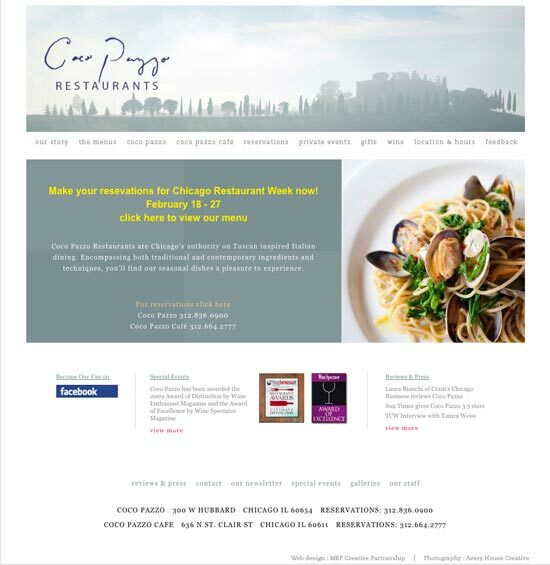 A strong web design can help a restaurant to more effectively market itself, can help convert visitors who find the restaurant by searching, for example, on Yelp, shopping for a deal through Groupon, or searching on Google or Bing. Your restaurant’s homepage is typically the most important part of your website. This is what your potential customers will first see when they visit your website and is often the link listed on various directories like Yelp. Because most restaurant sites have fewer than a 10 pages total, the homepage is also an important anchor for your overall site. Think about your potential customers. What are they most interested to find on your site? Most potential customers visit your restaurant to find hours of operation, phone number for reservations, directions (put a map on your directions page and make it easy for users to get directions, right on your page – here is an easy way to add a map), and a full menu (with prices). If you have several menus, list all of them. Make sure that those items are clearly labeled and easily accessible on your homepage – most visitors are not patient enough to play hide and seek on your site and a majority are visiting your site to look for either your menu or phone number. In fact, consider including your hours and phone number on every page on your site. Also – if you have a kids menu and welcome kids, make that clear on your site and make the kids menu available. I can tell you from personal experience (I have three kids) that this is important for parents who are looking for a meal with their kids. Remember too that many customers will find your restaurant’s homepage after reading reviews, so keep the content on your homepage focused and short. People typically read only 28% of the words during an average visit, so don’t overload your homepage with a lot of text. Tip: Make your menu available as text, not as a downloadable PDF. Users don’t like downloading files and many will be accessing your site without the ability to view PDS. If you want – make a PDF available in addition to the text menu. 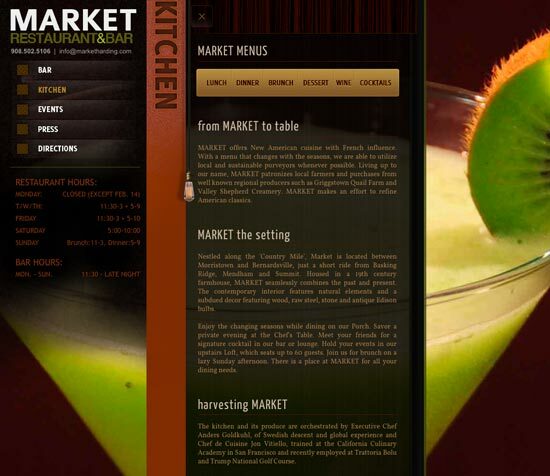 Tip 2: Here are some good examples of fresh restaurant website designs. Some more examples here. 2. Pay attention to colors. Color produces an emotional response in people – and importantly, different colors trigger different emotional responses. For example, red and orange are said to increase heartbeat and breathing. You’ll find red color on many restaurant websites (and inside many restaurants – including on table cloths). Black is generally correlated to a more upscale offering – it reflects elegance and sophistication. For a good read about colors and what they mean in different countries, I recommend you read: Colors in Web Design: Choosing a right combination for your Website. Tip: Don’t overload your site with photos or graphics. Although it’s been said that a picture can say a thousand words, pictures can also confuse and diffuse attention. Pick a few good restaurant or food shots and feature those on the homepage. Make sure you show high quality photos. The photo you took with your iPhone at 11pm isn’t going to cut it. 3. Consider Performance. Don’t use flash. Period. It doesn’t make you fresh and edgy. It simply annoys your users. And it doesn’t help you much in search engine optimization. Don’t play music on your site. People hate it. Save the music for your restaurant. Keep in mind that people are generally impatient when browsing websites and slow load times do impact conversions (getting people to buy your products or services). If your site design is graphically intense, you need to make sure you’ll have the hardware infrastructure and bandwidth to support the designs. Consider also that your visitors might be visiting from laptops and mobile phones, so try to avoid designing pages for a large monitor size or pages that use more complex features such as flash animation or navigation (flash isn’t supported on the iPhone, for example). This is a very common problem for many restaurants. In an effort to appear more upscale and modern, many restaurants chose to implement flash-based websites and while some of them are nice, they simply don’t work in many mobile phone environments. Another reason not to use flash. I can’t stress that enough! 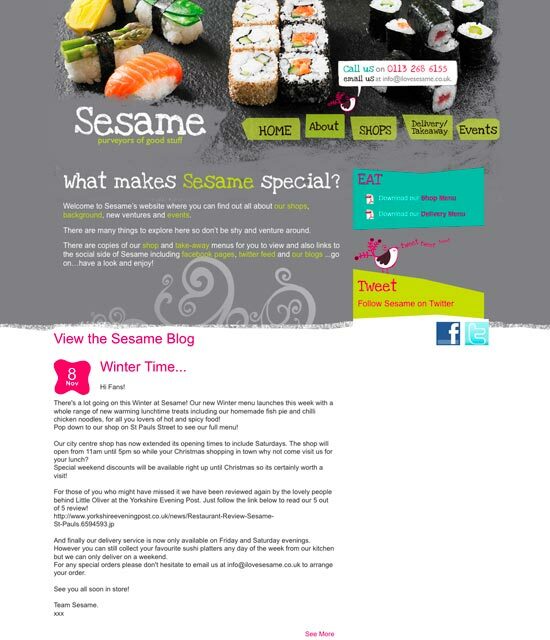 If your restaurant runs promotions or has special events, make that clear on the homepage. Although your visitors might be looking for a place to eat today, it helps to let them know that you’ll have special events in the future too – that way, you might turn a casual browser into a regular customer. Tip: Keep the discount/special event content fresh. If the event or discount has already passed, remove it from your site. Modern content management systems (like WordPress) make it easy to manage such content. Search engines prefer websites that are properly organized. This is important because you want your restaurant to come up in people’s search results when they search on Google or Bing. Remember also that you’re not just designing for search engines – people also prefer good organization. Have a strong navigation menu that clearly tells users (and search engines) how they could navigate your site. 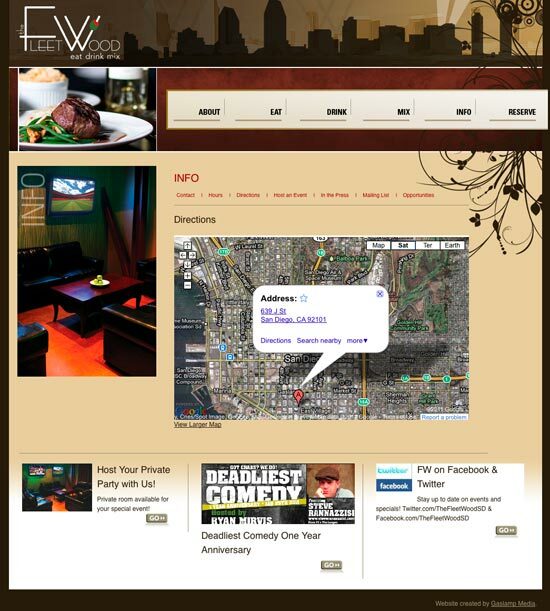 For example, can visitors to your site easily make a reservation or order by phone? Is your phone number clearly visible on the homepage? Tip: Use bold and larger fonts to present key information or to stress things you want the readers to notice. Add text color to stress the most important information. Keep in mind that most people will ignore content if the headline above the content doesn’t interest them – so don’t ignore good headlines (more on that in tip 6 below). 6. Content is important. You may already know that search engines index sites based on the quality of content (and links). The more content on your site, the more attractive your site becomes for search engines (more about search engine optimization in tip 9 below). People also like content. Don’t ignore headlines – they can be very powerful and can mean the difference between a visitor reading the rest of the content and leaving your site. People also like to see how your restaurant differs from others. For example, if you offer dietary considerations for gluten-free, kosher, diabetic, vegetarians or vegan dieters, prominently mention this. Saying so will help with search engine results and will be very helpful if people are loooking specifically for such information on your site. Tip: Study your successful competitors. Look at their websites, site colors, voice, use of graphics and photos, and organization. You also can look at the sites of restaurants you admire around the country (or around the world) to see how they present content for their visitors. For more information and tips for evaluating your competitors, I recommend you read Start-up tips: 10 Tips for Evaluating Your Competitors. 7. Understand the difference between design and development. To build a website, you’ll need both design for the site and development of the site. Although some freelancers can do both, the skills for design and development are typically different and you may want to leverage different people for each part of the job. Freelance web developers tend to specialize in frontend or backend work. Tip: If you decide to hire a freelance web site designer and/or developer, you should look for at least three people (or shops) and ask them for detailed quotes. You should also remember to ask for a few examples of their prior work so that you can evaluate their style and experience. 8. Consider the domain but don’t obsess about it. Your domain will communicate important information to your visitors. First and foremost, you want your visitors to remember your restaurant’s name. If the site URL doesn’t contain the name or contains only a portion of the name, your visitors might become confused and think that they’re on the wrong website. If you’re unable to find a URL that matches your small business name, you can consider changing the name or finding an alternative URL that includes the name – or or one that complements the name. 9. Don’t forget search engine optimization (SEO) and search engine marketing (SEM). For restaurants, like many other small businesses, efforts spent on one marketing initiative typically take away from other marketing initiatives. Search engine optimization and search engine marketing are highly specialized fields and require a substantial investment of time to learn. But SEO and/or SEM campaigns can provide great leverage to restaurants and as a result, should not be ignored. Although much of your traffic will come from review sites like Yelp, you can also find a lot of potential customers on local search engine searches. For a useful primer about small business search engine optimization and search engine marketing, you can read 10 Practical Small Business SEO and SEM Marketing Tips. For additional tips, I recommend PPC Tips for Small Business Owner and How To Leverage Rich Media SEO for Small Businesses. 10. Personality! People are attracted to restaurants with personality – so make your purpose, passion and differences clearly apparent. You don’t need to write 1000 words about the history of your restaurant – keep that content focused and make it fun and engaging. If you run a restaurant or are thinking about starting one and have a question about web design best practices for restaurants – please ask in the comments. 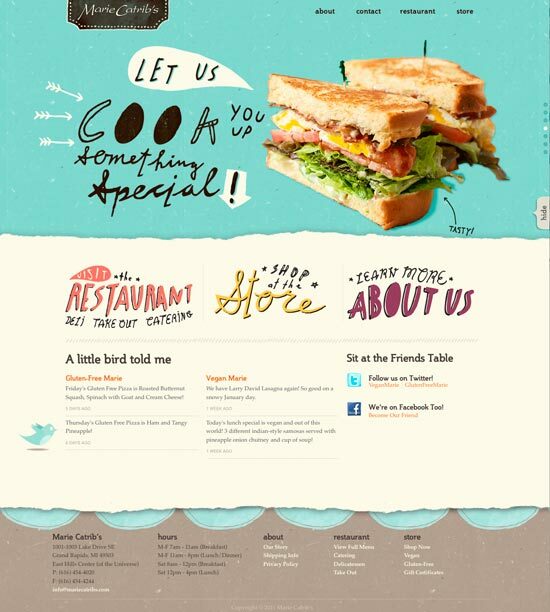 Can you suggest other tips and best practices for restaurant web design?